I had a great time at the 2013 Art of Adorning / Annual Bead Bazaar today. This is a fantastic event put on by The Bead Society of Orange County. The event features creators, importers and distributors of beads, jewelry and more. With such a diverse group of vendors, there was truly something for every one. This was the First time that I have sold finished pieces, I know…I know, it is about time. I realized when I was putting my display together just how vast my collection of jewelry creations is…and I only brought metal clay pieces with me!! Two cases were filled to the brim. 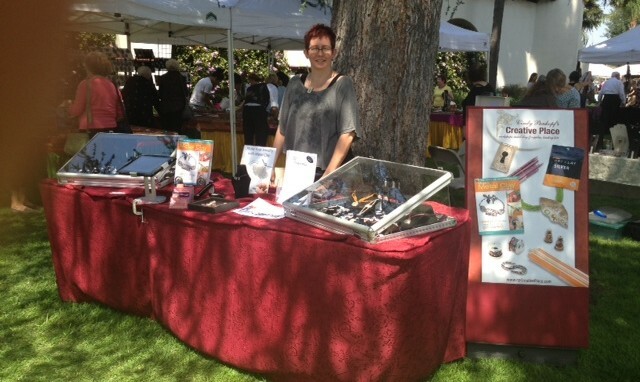 It was really fun introducing metal clay to so many people. It is still amazing to me how limited the knowledge is out there regarding metal clay. It really makes me glad that I have devoted my livelihood to writing, teaching classes and workshops in metal clay at my Creative Place! Many people seemed interested in my new metal clay “Charming Parties” which allow folks with no experience to get together with a few friends and make up to four custom pieces in about an hour for a huge bargain. Hopefully I will see some new faces I invited next Saturday for a “Charming Party” open house. I had a great spot under the shade of a giant evergreen tree. Next year I will be bringing more business cards and fliers so I don’t run out again. I hope to get the same spot again next year…see you then.